One of the great pleasures of being involved in a charitable foundation is the reward you get from seeing the real results of your efforts. On October 30th, Ill. Bro. Gordon Greasley 33°, Ill. Bro. Allan Hadley 33° and Ill. Bro. 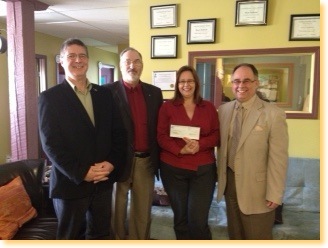 Jimm Simon 32° presented some well needed funding to Cheryl Hoffman of the KC Dyslexic Centre in Winnipeg, MB. Following the cheque presentation, Ms Hoffmann provided a tour of the centre and a detailed explanation of Dyslexia as well as how the centre works with people of all ages to overcome their learning disability. KC Dyslexic Learning centre provides testing and tutoring services that help people overcome both math and reading difficulties related to dyslexia. Dyslexia is not a rare disability. In fact, approximately 20% of Canadians deal with some form of dyslexia ranging from mild to profound? Even more startling is this statistic jumps to over 40% of the aboriginal population. Dyslexia is often an inherited disability and frequently not diagnosed, or misdiagnosed, until later in life. The KC Dyslexic Centre has over 10 years of operating experience and over 400 students. They have moved all but 2 of their clients from a reading level, at or below grade 2, to over grade 9. Normally students take 2 years to complete their program. Funds received from the Scottish Rite Charitable Foundation Deputies Bursary Program will be applied directly to the tuition of a specific rural school age student who will now be able to attend weekly learning sessions.